A Summer parade in Ramsgate today (July 29) was rubbish – literally. The Plastic is not Fantastic parade was part of the Ramsgate Festival of Sound and featured outfits and creations made of discarded plastic found around the town and beach. 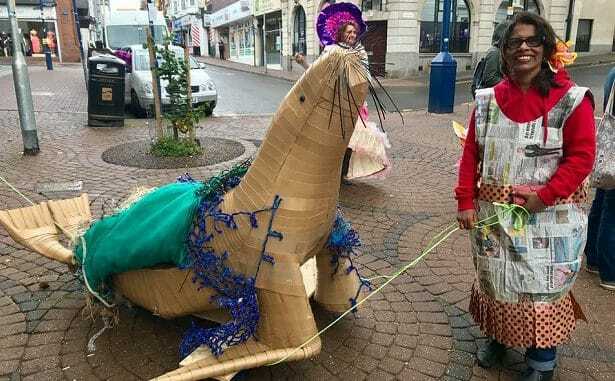 Among the parade was the 4.4 metre Dilys the Princess of Whales, created by 61 pupils at Ellington Infant School as part of a project about waste and the environment. Dilys is made entirely of empty plastic bottle, cartons and bags. Also on parade was a ‘rubbish seal’ made at AiR (Arts in Ramsgate) in Harbour Street. The parade, shown in the video above by Kyel Matin of The682Media. was funded by Ramsgate Town Council and involved groups such as Ramsgate Town Team, Arts in Ramsgate, Addington Street Community Group, Ramsgate Arts and local schools.